Interrupted El Daklyeh's defeat to Pyramids in the 80th minute. 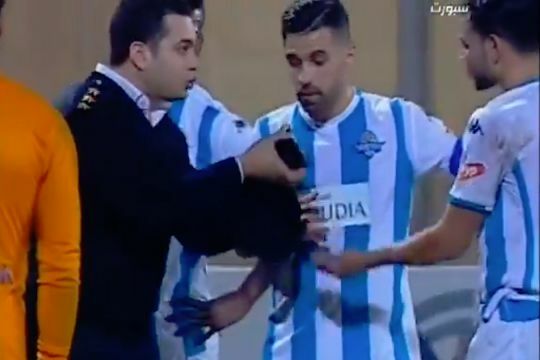 A policeman made his way onto the pitch and showed his ID to a player in the middle of El Daklyeh’s clash with Pyramids in the Egyptian Premier League. The police officer interrupted the game at Al-Shorta Stadium in Cairo on Monday with just over ten minutes remaining. Some of the Pyramids players angrily objected to the armed intrusion and are said to have asked him to produce identification. He seems only too happy to angrily oblige before being encouraged off the pitch by the team. The reason for the man’s appearance is unclear but El Daklyeh share the ground, also known as the Police Academy Stadium, with lower-league side Ittihad El Shorta – themselves also known as Police Union. Two added time goals won it for the visitors who came away with a 0-2 win.